A huge welcome to Week 35 of the Tuesday Tutorials Pintorials Pin Party! This week I am featuring food. Each week after watching Great British Bake Off, I can’t wait to get baking! So I made white lotus sandwich cookies! This week, we have Mummy’s blog who made an easy recipe of cheese and bacon wraps. Then we have Anna from In The Playroom who went to an Actimel event along with me and this is her post on her children’s bread monster and spaceship! Next, we have Cheeriolala who made a poop recipe unicorn poop! Yes, poop! They are edible colourful poop. Lastly, we have Craft On Sea’s husband who made this slow cooked bronco stew. What is so special is that there is a lot of wine! Don’t forget to pop by to take a look at Kate (Calming Activities), Anna and Hodge’s (Nature) blogs to see who is featured this week. First time joining us? Simply add your posts to the linky and they will be shown across all 4 of our host blogs (myself, ET Speaks From Home; In The Playroom; Hodge Podge Craft and Craft on Sea) and then pinned to our group board. Each week the 4 of us will showcase a selection of three posts each to feature the round up on our blog along with the next weeks’ linky. Link up your post – it can be a tutorial, how-to or even food recipe – old or new! 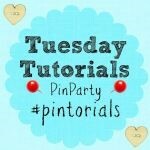 Please kindly follow the Tuesday Tutorials Pin Party board. Please also kindly follow the hosts on Pinterest. This is not essential but would be appreciated! Please visit at least three other blogs on the linky if you can and pin some of their fabulous tutorials to your own boards. Do use the #pintorials hashtag to let them know you found them via the linky. We would love it if you could give us a text link or add the badge to your post or your side bar. The more people know about the #Pintorials linky, the more can join in and the more pinning we get to do. Looking forward to reading about your shared blog post with us this week!